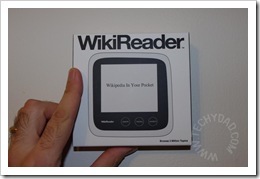 When I first heard about the WikiReader, I was intrigued. Being able to browse Wikipedia locally, without any Internet access needed? That could be very useful. Of course, I was very excited when I got the chance to review it. 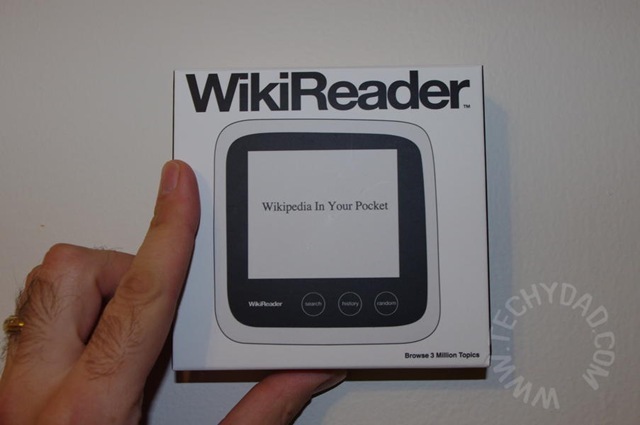 My first impression was that the WikiReader was small. Very small. It doesn’t really need to be that big, though. The whole purpose is to be a portable reference source. Turning it on, I was pleasantly surprised with how easy it is to use. There are only four buttons: Search, History, Random and Power (located on the top of the device). The rest of the functionality is handled by the touch-screen. You type out search terms on the virtual keyboard, select interesting items, follow links and more by touching the screen in the appropriate spots. Scrolling is accomplished by pressing your finger down and moving up or down. Of course, as a reference work, Wikipedia is always being updated. So if WikiReader just shipped Wikipedia as it existed at ship-time and didn’t give any means of updating, it would quickly become useless. Luckily, there are two methods of updating. 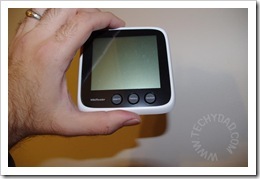 Both involve the tiny memory card stored within WikiReader. 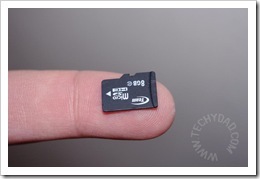 Yes, that tiny thing stores all of Wikipedia and more (which I’ll discuss soon). The first update method is to pay $29 and receive two cards per year delivered to your home. Pop out the old card, pop in the new card and you’re all set. 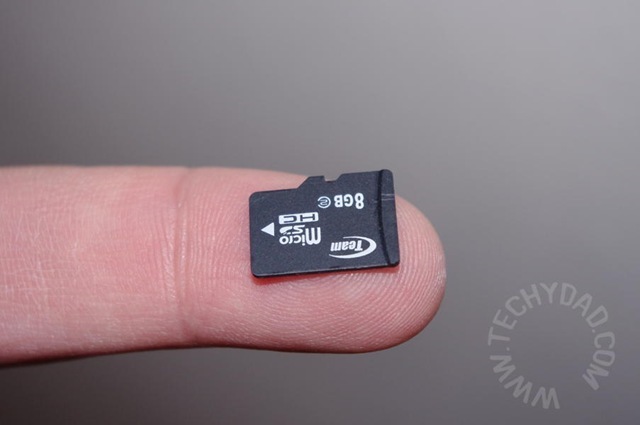 You can keep the old cards for use in other devices that use microSD cards. The second update method is to install their free update application. 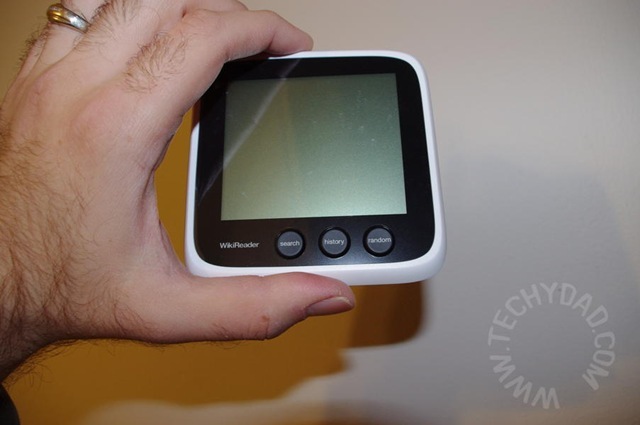 When you’re ready to update, pop the microSD card out of the WikiReader, connect it to your PC (via a card reader and/or adapter of some sort, both readily available from various stores) and run the update program. These updates happen once per quarter so you’ll get four updates per year. Now, for the “and more” from before. If the WikiReader just stored Wikipedia, it would be useful, but they’re not content to rest on their laurels. They also include Wiktionary (an online dictionary), Wikiquotes (a quotes database) and, most recently, 33,000 books from Project Gutenberg. A warning about that last one, though, it requires a 16GB microSD card. These can be purchased for $25 or so from places such as NewEgg. I haven’t actually had a chance to test the Project Gutenberg books (I meant to temporarily remove Wikipedia and load on Gutenberg, but I’ve been busy dealing with my photo disaster.) I must say, though, that before the announcement I had wondered about getting the Project Gutenberg books on there. For all of its strengths, there are tradeoffs, though. You won’t be getting any of the images that appear on Wikipedia. Neither will you get any text that was formatted in tables. On one hand, it cuts down on the amount of data you need to store and makes it easier to display. On the other hand, this can leave gaps in the Wikipedia reference material. It also only searches Wikipedia titles, not the full text. This last part might be fixable, though, considering that the code that the device runs on is open source. Of course, I’m sure that some people are wondering “Why don’t I just use my laptop/iPhone/iPad/Smart Phone/etc to access Wikipedia.com and get the latest versions with photos and everything?” Yes, you *can* do that, but that assumes that you have Internet access. Many smart phone plans either cap you or force you to pay per byte. Accessing Wikipedia constantly can run up your charges. Booting a laptop can also take awhile versus the sub-second boot time of WikiReader. There are times when I’d use my laptop (or smart phone if I had one) and times when I’d use WikiReader. The other advantage is with children. NHL took to the WikiReader instantly and was looking up article after article. I didn’t need to worry about him wandering onto a different website that I didn’t approve of: He was “stuck” on Wikipedia. There are also parental controls available, but I didn’t test these out. 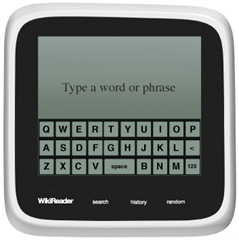 Thanks to Openmoko, makers of the WikiReader, one lucky winner will receive a WikiReader. To enter, simply leave a comment below answering this question: What topics do you look up on Wikipedia? To enter, please follow the rules above within the comment section. Contest starts today, December 21st and ends at Noon EST on January 6th, 2010. You do not have to be a blogger to enter, but must leave a valid e-mail address for me to contact you for mailing address once the giveaway is over. I will select the winner using random.org and contact you via e-mail. You will have 48 hours to claim the prize. If there is no response, another winner will be selected. Open to U.S. only. Disclosure: I was given a WikiReader for free to review by Openmoko. No other compensation was given. The opinions expressed above are my own. 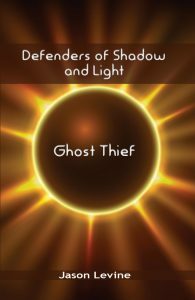 Openmoko is also providing the giveaway item to my readers. Good review – never heard of this before. I would say I look up history (events) related things the most on Wikipedia, also brand histories I find interesting too. I’m now subscribed to your feed too! I look up just about everything on Wikipedia…for work, I find additional sources to back up what I find but if I’m just wanting info for me, I don’t sweat it. That looks like a great way to take Wikipedia portable! I am a homeschooling mother of six (the seventh child is to young yet) so we look up everything. From Science topics to books to history. I think we probably at one time or another looked up something from every topic available. Oh wow, this WikiReader is the coolest thing. I use Wikipedia a lot. The topics I search most for are movies, celebrities, historic events, locations and a whole bunch of things. It would be so cool to have this tiny gadget to take with me so I can just look then and not wait till I get home to my computer. I commented on your Disney On Ice disaster, post. I commented on your post “Snowy Sentiments”. If I had a WikiReader, I would undoubtedly use it when lurking about with my friends and the inevitable topic that someone knows quite a lot about in the rest of us know very little about comes up to supply footnotes in annotations to the ongoing conversation. Alexander Williams recently posted..Last Batch of Pics From NYE @ The SquidLair! I followed @TechyDad in Twitter. I followed @wikireader on Twitter.